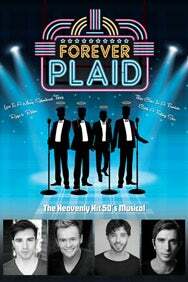 We do not curently have theatre tickets available for Forever Plaid This could be because we have simply sold out or it could be that this show is no longer running. The information on this page remains purely for historical and informational purposes. With one final chance to give the concert they never gave, The Plaids sing nostalgic hits “Rags To Riches”, “Love is a Many Splendored Thing”, “Catch A Falling Star”, “Three Coins In A Fountain” and many more  all in glorious harmony with patter that will keep any audience rolling in the aisles. Jon Lee stars alongside Keith Jack, Matthew Quinn and Luke Striffler.